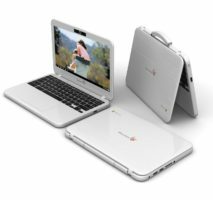 The first rugged Chromebook on the market. This is the tank of Chromebooks. If you are working outside of an office – then this is a great choice for you. 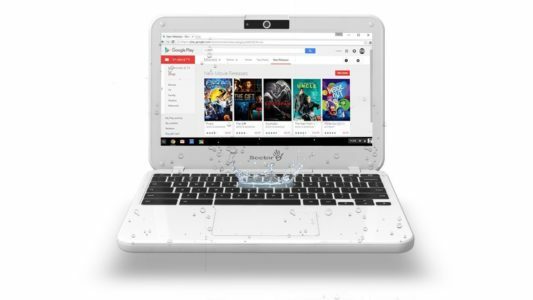 This is not for taking with you in the pool – but rest assured, this Chromebook is for the on-the-go user. This is a small form factor chromebook laptop with all the bells and whistles you’d expect. Webcam, wifi, bluetooth and all in a rugged package – perfect for the young user or someone who is always on the go and need a laptop that can stand up to day to day use which is not all in the office. As stated – you can use Google hangouts with the webcam. And if you need more storage – then add an SD card for more. And if you want to add a monitor – use the HDMI port. 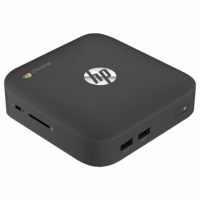 If you are short on space – let the HP Chromebox turn your monitor or HD compatible TV into a working web machine. You can use wires or WiFi to get internet signal. Super small, super simple and super quiet. 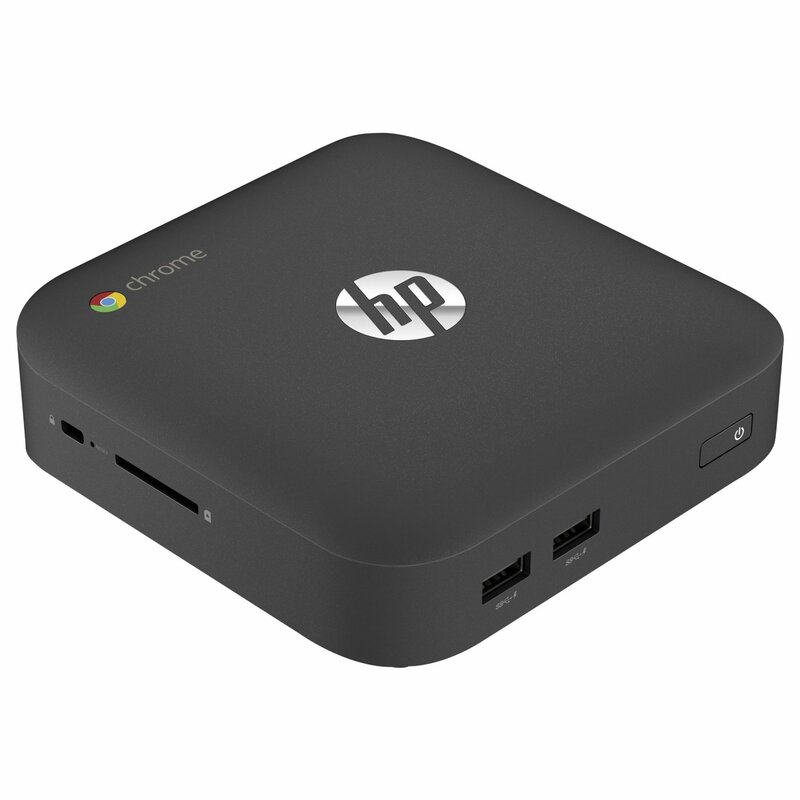 The HP Chromebox has no fan, so it makes it the perfect fit for a media straming PC for the rec area or media room. And the easy to access SD card slot will make sharing other media and photos a breeze. At less than $140 there is a lot of bang for the buck. Not sure – check out our Best Chromebooks post. If you have a TV you’d like to turn into a computer – this is the thing that can do it. At under $85, you can plug this ASUS Chromebit into the HDMI input on your TV and, using a wireless keyboard and mouse, be surfing the internet. It is really crazy what is being done in an HDMI stick that measures just under 5 inches long. Installation is as easy as plugging the ASUS Chromebit CS10 into a TV and connecting a bluetooth keyboard and mouse. Chromebit CS10 gives you the power of a google chromebook in a package you would never is even know is connected. A true computer which fits in your shirt pocket. 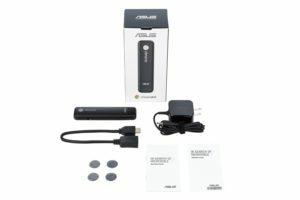 The ASUS Chromebit will connect to your internet provider via WIFI (dual band a/b/g/n/ac) and with the Bluetooth 4.0 connection, the keyboard and mouse will be quick to respond. Chromebit CS10, like all Chromebooks, will update itself – so it is always running the latest software from Google, so you’ll always have the latest features and virus protection. That happens at no extra charge for you – and keeping all the “junk” off the computer makes it stay speedy for the life of the computer. With account based data – the ASUS Chromebit CS10 works great as a shared computer. People log in and out of the device with their own Google account and the data is not shared. So everyone has their own information for themselves. 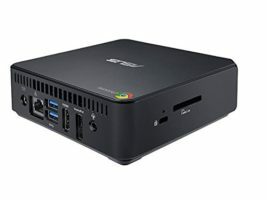 The Asus Chromebox is the ChromeOS version of the Mac Mini – compact and portable minus…but it doens’t have the full featured operating system of OS X. It’s as small as the typical router and comes with PC hardware – meaning its quicker than the ARM processors found in many Chromebooks. You will find many versions of the Asus Chromebox: a Celeron processor w/2 GBs of RAM, a Core i3 processor w/4 GBs of RAM and one w/a Core i7 – 4 GB of RAM. Some come with a wireless keyboard and mouse. The ASUS has an internal fan – but it is very quiet. This makes it ideal for living room set-ups. It’s equipped with a 16 GB SSD, WiFi and Bluetooth. Be careful when looking at different options – some packages come with a keyboard and mouse, which is nice if you don’t already have a spare. Don’t forget – you will also need a monitor. The Asus Chromebox is consistently fast, even when running at 1920 X 1080 resolution. While it handles 1080p videos without much trouble (albeit slight artefacting), it cannot stream 4K videos without suffering major stutter. One major advantage of the box is that it can handle two displays at once. In other words, it’s quite good at what it does for less than $150. The LG All-In-One has been upgraded. It has some nice enhancements, making it feel much more like a true desktop system. 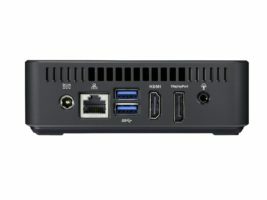 The upgraded version also allows for a dual monitor setup using the built in HDMI port. 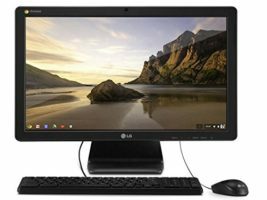 It comes with a gorgeous 21.5 full-HD 1920 x 1080 display, a keyboard and a mouse. Despite the a price tag at $300, the screen is nice, offers good color quality and viewing angles. The screen is a matte finish which greatly reduces glare. Buttons on the monitor allow you to change the “mode” of the screen from normal to reading – which is best for long reading or writing sessions. The screen doesn’t come with touch capabilities as the OS itself wasn’t made with that form of input in mind. It also includes a webcam. Unfortunately, the webcam is not HD and is just “ok”. 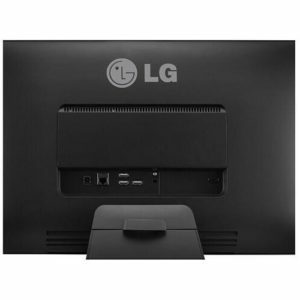 As with most of these systems, the LG comes with built in WiFi and Bluetooth. Most Chromebooks also come with a year of Google’s cloud storage – the LG comes with 100 Gig. The Chromebase is equipped with a 16 GB SSD. 2 GBs of RAM and an Intel Celeron 2955U processor. Web applications like Google Docs, Facebook, YouTube and flash based games run lag-free as long as you don’t ahve too many tabs open. Lastly, the keyboard and mouse leave much to be desired. The buttons on the keyboard feel squishy and lack the click you come to expect of office keyboards. And the mouse feels cheaply made and hollow, which is odd given the quality of the monitor. That’s not to say that they’re not functional though. They work alright, but at the cost of efficiency. The are USB, so they can be switched out for better units. How can I connect it to my internet connection? You can use either a WiFi/wireless connection or plug it directly to your network/router with an ethernet cable. Does it have a webcam? Yes – a full HD webcam. Can I use a Bluetooth keyboard? Yes – there is full Bluetooth support. Does it have USB ports? Yes – 3 to be exact.